My practice trackers tell me that I hit Day 70 of my #100daysofpractice challenge yesterday. So much for doing a post at the midway point. All I can say is that spring is a busy time musically. Better late than never. Things are chugging along, but real-life musical commitments (along with just real life commitments) have been taking precedence over the trio of pieces that I wanted to highlight this challenge. Prior to Spring Break, I buckled down and recorded teacher demos of most of my Grade 1 - 6 students’ repertoire. With music festivals and exams coming up, getting clips up to help my students finetune and polish was more important than learning Papillons. I guess that’s just a reality I have to accept as a music teacher and choir musician. I am now on the roster to play the piano at funeral services at three churches. On one hand, I feel sad, seeing that I started gigging by playing at weddings and banquets. You know, happy occasions. Now, I’m sending people off. However, there is honour in giving the departed a fine send off musically, so I’ll do the best I can. Of the featured trio, Happy Together is furthest along. I have learned the song on voice, ukulele, and cajón. Although I am still tripping on a couple of chords and lyrics, I am getting close to being able to record a virtual performance. Papillons? Ugh. I performed the Introductzione and No. 3 at last month’s studio piano party. It was OK. I am learning to relax my hands on those blocked octaves, but it’s nowhere near ready to be brought up to speed. Nor do I have any desire to. I am currently learning No. 7. It’s slow and that’s fine. Once I have learned it, I’ll call it a day and put it away. I dusted off Leyenda (Asturias) from Isaac Albéniz’s Suite Espagñola. It’s the last piece that Mrs. Ginzburg taught me during our time together. Enough time has passed that I think I have something new to bring to it. Plus, I simply love the piece, whereas, I don’t like Papillons. Danza del gaucho matrero has been placed on hold until I have finished Papillons. That should happen this week. I do want to have the entire Danzas Argentinas relearned by the end of this challenge. With Easter fast approaching, my practising will be dominated by music for Easter Triduum (Holy Thursday, Good Friday, Easter Vigil) and Easter Sunday. Although my brother and I are splitting the bulk of the piano duties (the other pianist is taking the last service - yay! - because I plan on being home, fast asleep for that one), I will probably sing and/or play the cajón for the services I am not playing piano. Lots of dots = lots of progress, in some areas. Credit: R-M Arca. My ear training drills have been paying off. My a capella singing is stronger than in years past. Credit: R-M Arca. Singing and ukulele seem to go hand in hand. Well, until I trip on a chord or a word, that is. Credit: R-M Arca. I’m so glad I picked a percussion friendly piece for my non-dominant instruments. Credit: R-M Arca. 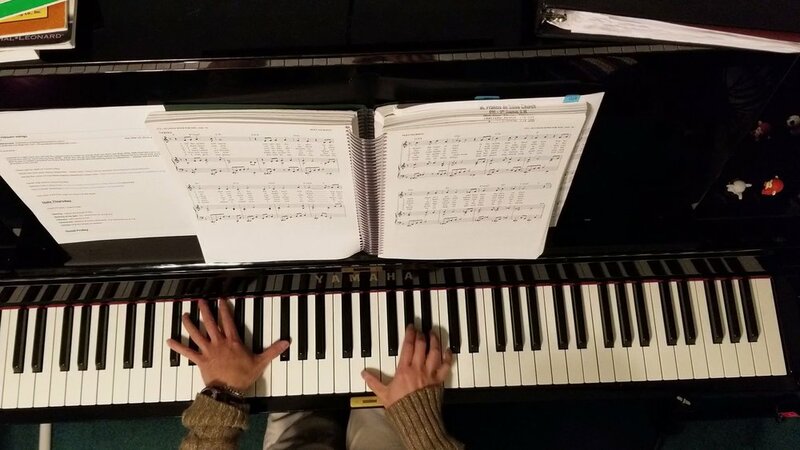 I am facing the same challenge that my piano students face: how to fit enough physical practice time into the week. Although I do notice an improvement overall because of my increased budo study time, nothing really beats committing things to muscle memory through repetition. Camera sensei continues to be my best friend during at-home practices. However, with weapons that range from 20 inches to six feet long, I am limited by ceiling clearance and space. If I break another light fixture or accidentally slice a plant, my kouhai (juniors) will never let me live it down. Thankfully, spring is here and I can go train at a nearby park. Just in time, really. We will be doing martial arts demonstrations at the Calgary Expo later this month, so I better kick things up a notch. Ka Muso Kai will be demonstrating all of the arts we practice: Iaido, Jodo, Hyoho Niten Ichi Ryu, and Choken Battojutsu Kagéryu. More dots but the majority are in the “Study” column. Need to change that up this month. Credit: R-M Arca. There is so much math in Iaido that it’s not funny. Here, I’m checking my angle before completing the cut. Credit: R- Arca. Not only is my mic stand a camera stand, it also serves as my training partner in Jodo. It goes into Chudan very nicely. Credit: R-M Arca. One of my kouhai got his iaito recently. That prompted this “dojo family photo” after training. Credit: R-M Arca. After a seminar or a really good class with sensei, writing down all the tips is critical. At least, it is for me. Credit: R-M Arca. As I listen to my students and myself play, it is wonderful to see and hear how much progress we have made. However, as the year ramps up, physical, emotional, and mental fatigue will become a bigger challenge to face. We have all learned different ways to practice, but we are noticing the need for taking some time off. Rest gives us that time to reset, refresh, and come back to our work with a fresh perspective. We will all have to figure out what that ideal balance is. For me, I think musically, it will be six days a week, with five days being on my instruments and one day dedicated to scorestudy and/or ear training. Budo-wise, I think it will shift to five days a week, with three days physical training and two days of study. The breakdown will vary depending upon what else is going on, but the main thing I will take moving forward is planning my practices so that everything gets worked on regularly. Although having said this, I may just carry on with daily on both fronts but take a day off when I need a day off. I just need to make sure that I don’t go beyond three days off. Violinist Jascha Heifetz once said: “If I don't practice for one day, I'll know it. If I don't practice for two days, the critics will know it. If I don't practice for three days, the whole public will know it." Three of my students have completed their 100 Days of Practice Challenge, with a handful expected to wrap theirs up this week. The remainder are slated to complete their challenge around Easter. I will share their reflections once they have turned in their surveys. Some of my students have opted to do another 30 Days of Practice Challenge, working in a break before doing another round. Others have decided to complete another 60 Days of Practice Challenge - with a little break before and after the challenge. The general consensus for next year is that we will do a 100 Days of Practice Challenge but it won’t be consecutive days of practice. Obviously, if a student opts to make it 100 consecutive days of practice, they’ll reach their goal more quickly than someone who takes a few days off. I do hope that students do take a day off here and there though. Resting our minds and our bodies is just as important as practice frequency. It’s a fine balance. To find out more about my 100 Days of Practice Challenge Rules, check out my Reflecting on My First 100 Days of Practice Challenge post.